Chaiseri is Thailand’s specialist for tracks and wheels for armoured vehicles which has taken part in some of the biggest defence shows and has won business in the defence field throughout the world. Chaiseri Metal & Rubber Co Ltd is a Thai company located in the province of Pathumthani, which is located in the north of Bangkok, Thailand with a considerable history since it has been operating in related business for more than 30 years with the policy of supplying high quality products according to customers’ requirements at competitive prices. Previously, Chaiseri ran a business in the production and services of rubber and rubber to metal bonded parts for commercial cargo trucks such as torque rods, rubber bumpers, rubber and rubber to metal bonded parts for cargo trucks that was very well known among cargo truck owners and drivers. 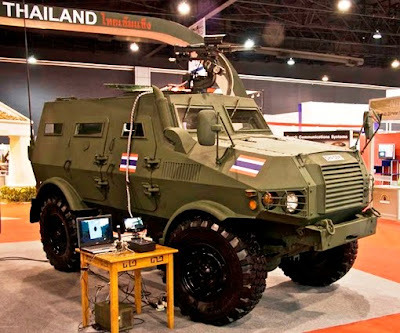 With experiences in the field of rubber to metal bonded parts production had continuously grown, the company has increased their capability in production by purchasing various machines from several countries for the production of track shoes and road wheels for all types of armoured track vehicles to support the Royal Thai Army. The company also completed several projects of re-manufacture of M35A2 trucks and M151A2 jeeps. At present, Chaiseri is one of the major military product suppliers for the Royal Thai Army. Having multiple facilities and experience in various products, Chaiseri have supplied their products to worldwide customers (more than 20 countries) with satisfaction guarantee. Essentially Chaiseri is a producer of rubber, rubber-to-metal bonded parts, and metal products. Amongst its metal products include ammunition box for M19A1, M2A1, and M548 type weapons, and hand guards and magazines for M16 rifle. The company also specialises in wheels and support wheels for all types of tracked armoured vehicles including; US Tank: M41, M42, M48, M60, M88, M-107/110, M-109, M-1, APC M-113, Half Tank M-3, M-16, German Tank: Leopard I and II, British Light Reconaissance Tank: Scorpion, French Tank: AMX13, Leclerc MBT and the Russian APC: BMP3. Chaiseri was also involved in the design & development and manufacture of the tracks for Russian tanks: T-54, T-55 and T-59 , Tracks for Chinese Tank: T-69 and Chinese APC T-85 Track for British Tank: Scorpion Track with Replaceable Pad and Rubberized Horseshoes. Chaiseri are specialist in the repair, remanufacture and upgrade of all types of military wheeled vehicles, armored tracked vehicles, automatic transmissions and engines up to 2,000HP.